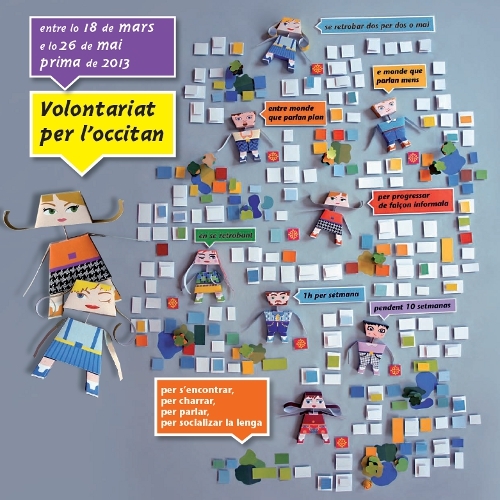 Just like « Volontariat per aranès », « Volontariat per l’Occitan » aims at putting someone – a « Volunteer » – who speaks Occitan fluently in contact with another person – a « Learner » – who has a knowledge of the language but no fluency. – You want to pass on Occitan ? – You’d like to get fluent ? 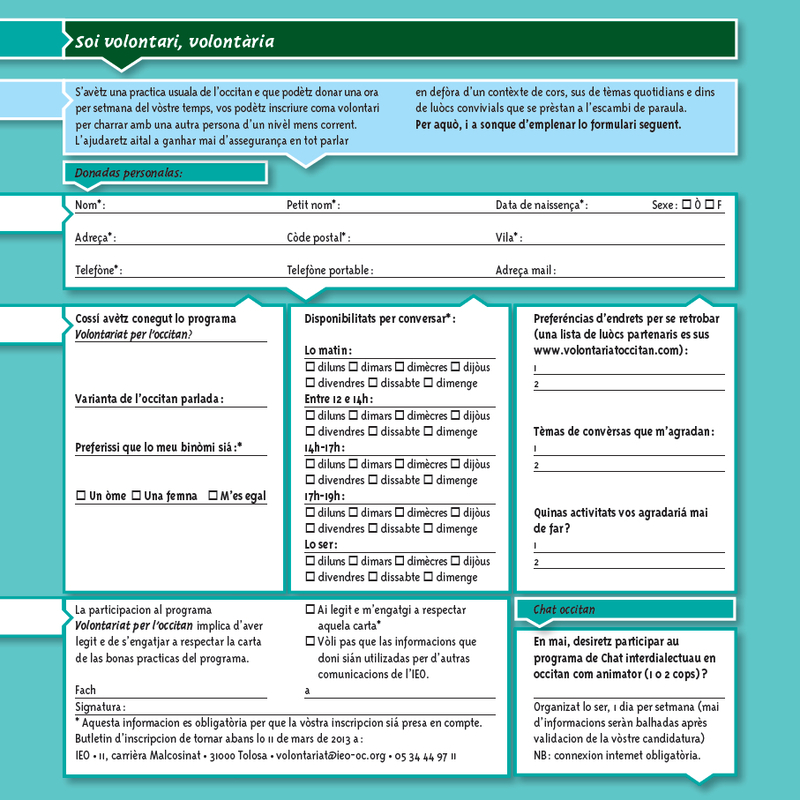 Don’t hesitate any more, sign up for « Language volunteering » ! Frequency : Learners and Volunteers meet up and talk for about one hour a week during 10 weeks running. There’s nothing to stop them going on afterwards. Place : Wherever they like, apart from an Occitan class. Several public premises, belonging to organizing partners, are at their disposal (within opening hours) : bars, libraries, associations, etc. that support the Occitan language. Any other place can be chosen. Volunteers : no language certification is necessary, only the wish to share one’s knowledge, far from any teaching context. Learners : adults with a basic knowledge of Occitan who wish to gain in confidence and fluency and use Occitan in their every day life. 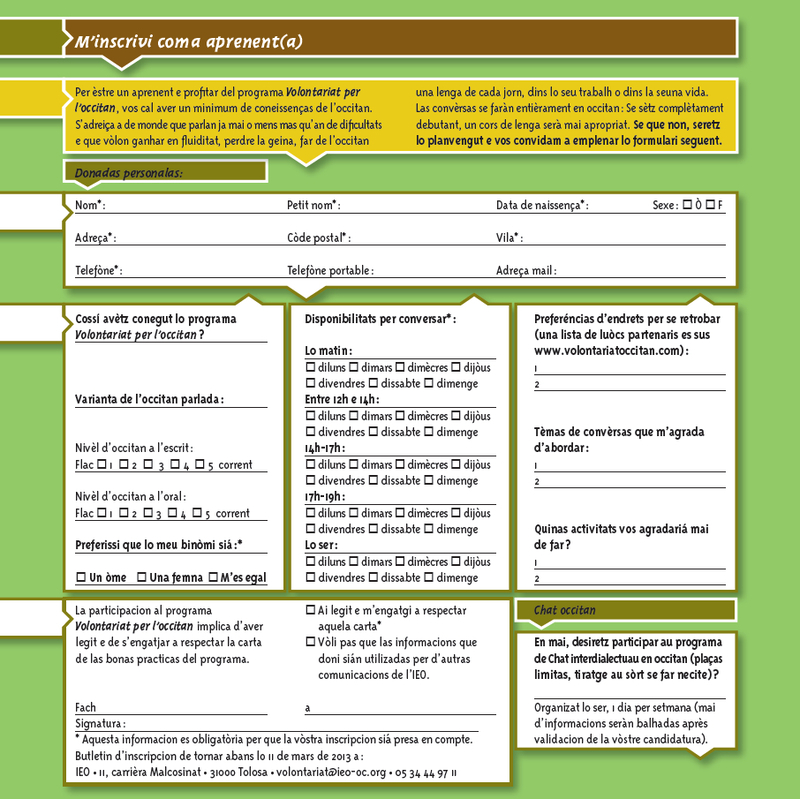 Guide to fair practices : Anyone who signs up undertakes to follow them. Campaign dates : Initially scheduled on set dates at national level, « Language volunteering » is valid all year round in Limousin. Signing up : Signing up is free. We try to match « linguistic pairs » that will meet up and talk, according to the availability and interests mentioned in the applications. You will be given your partner’s address and phone number and you will have to get in touch and agree on a first meeting. The campaign was launched by the national I.E.O. for the first time in 2011.